Before starting this walkthrough, you should read the help topics on the Configuration Tool, and Getting Started. These topics provide background information on using the Configuration Tool. 1. Right click on Folder and select New Tag, followed by Mitsubishi Melsec, followed by Melsec serial channel. CommFormat Frame format 1 is the most widely supported across all of the different PLC types. Keep the default of Format 1, unless you know a different frame format is being used. Mode Click the Browse button to edit the serial port mode using the Serial Port Mode Editor. Port Click the Browse button to choose the COM port the PLC is connected to. For example COM1. 1. Right click on Folder and select New Tag, followed by Mitsubishi Melsec, followed by Mitsubishi Melsec device. Channel Click the Browse button to open the browse dialog. Select the channel created earlier. PCNumber For a direct connection between Fernhill SCADA and the PLC, keep the default of 255. PLCType Choose FX, A-Series, or QnA or Q-Series. StationNumber Enter the station number. Note: Once the PLC tag is associated with the Channel tag, Fernhill SCADA will attempt to establish communications. You can monitor the status of the PLC tag in the Status Monitor Window. 1. Right click on Folder and select New Tag, followed by Core, followed by I/O Digital Tag. 3. In the Properties Window enter suitable values for the Mitsubishi Melsec digital tag properties. AllowControls Keep the default value of False. IODataSource Click the Browse button to open the browse dialog. 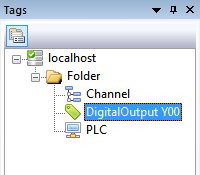 Select the PLC Device Tag created earlier.